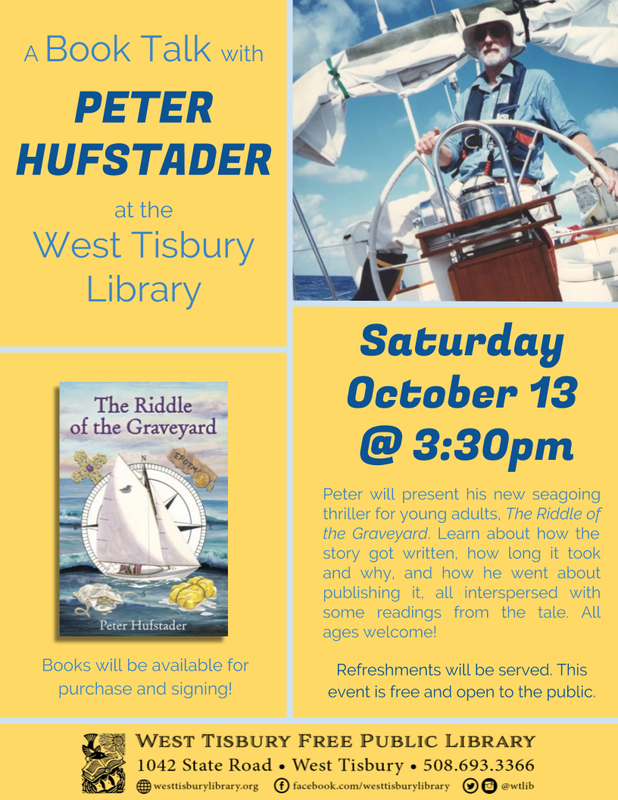 On Saturday, October 13 at 3:30pm, join us at the West Tisbury Library for a book talk with author Peter Hufstader. Peter will read from his new seagoing thriller for young adults, The Riddle of the Graveyard. Learn about how the story was written, how long it took to write, and how it became published. All ages welcome! Books will be available for purchase and signing. Refreshments will be served. This event is free and open to the public. Set on a fictionalized version of Martha’s Vineyard after World War II, this suspenseful tale is written for middle school to adult readers. Fans of Arthur Ransome’s Swallows and Amazons books will especially enjoy the characters and their adventure. The Riddle of the Graveyard is the debut novel by lifelong sailor Peter Hufstader. Peter grew up sailing on MV after World War II and set his story in a similar place and time. A retired educator, Peter taught at Darien High School in CT and the Wheeler School in Providence. He has also taught coastal piloting and navigation. In his retirement, he worked as a researcher for the Common Cause of Rhode Island.